Patterns ground me. I’ve tried to make work that had nothing to do with patterns, and it didn’t feel like me. In the midst of midterm election shenanigans in the U.S., working with the Voronoi diagrams has provided me with times of peaceful creation and discovery. ©Elizabeth Busey. Multiplicative. Monoprint collage (unique) 12 x 12in. 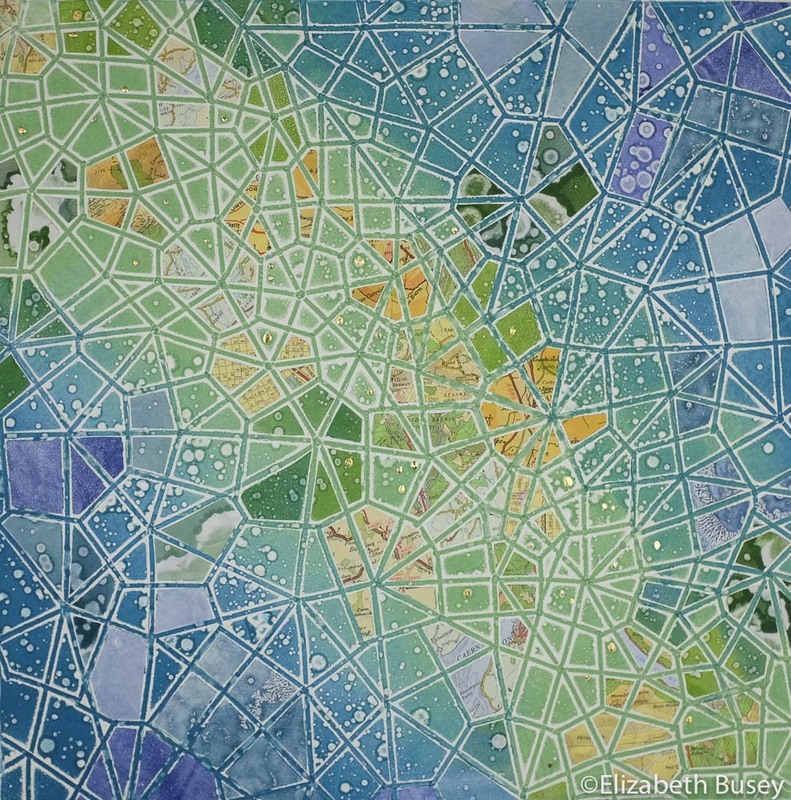 This entry was posted in Botanicals, Monoprinting, pattern, Topography and tagged fields, grounding, leaf structure, patterns, topography, Voronoi diagram on November 7, 2018 by Elizabeth Busey. 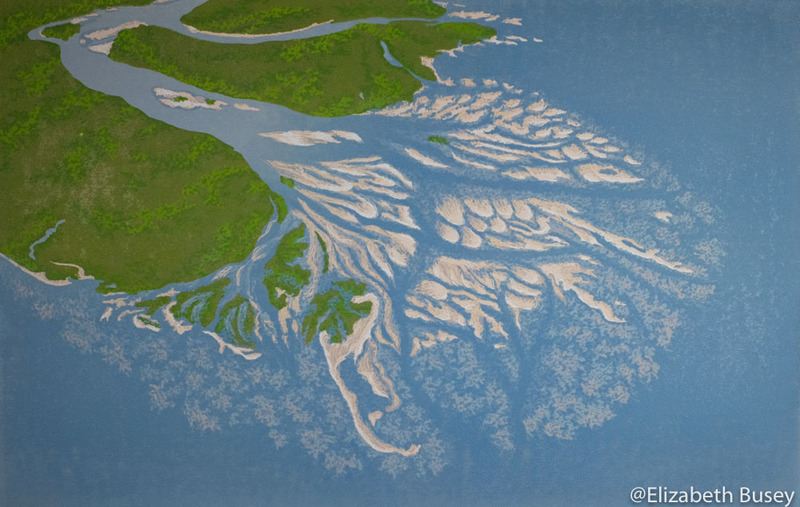 My latest linocut commission has been safely delivered, so I can now reveal Flowing Freely — Goose River. ©Elizabeth Busey, Flowing Freely — Goose River. Reduction linocut on Rives BFK, 14 x 22in (image size) ed. of 7, $375. This entry was posted in Commissions, Topography and tagged Canada, commission, geology, Goose River, river delta, topography on April 16, 2018 by Elizabeth Busey. Printmaking can sometimes take an eternity. Or this is how it seems. My first art professor impressed upon me that unlike reading a book which can be skimmed, or writing a paper during an all-nighter, making art takes the time it takes. This fall, I have found this to be true. I decided to create a linocut concept that had twelve layers of ink, the most I have ever done. Elizabeth Busey. On the Far Side of Forever. Reduction linocut on Rives BFK. 16 x 21in (image size), 28 x 37in (framed size), edition of 13, $375 unframed. 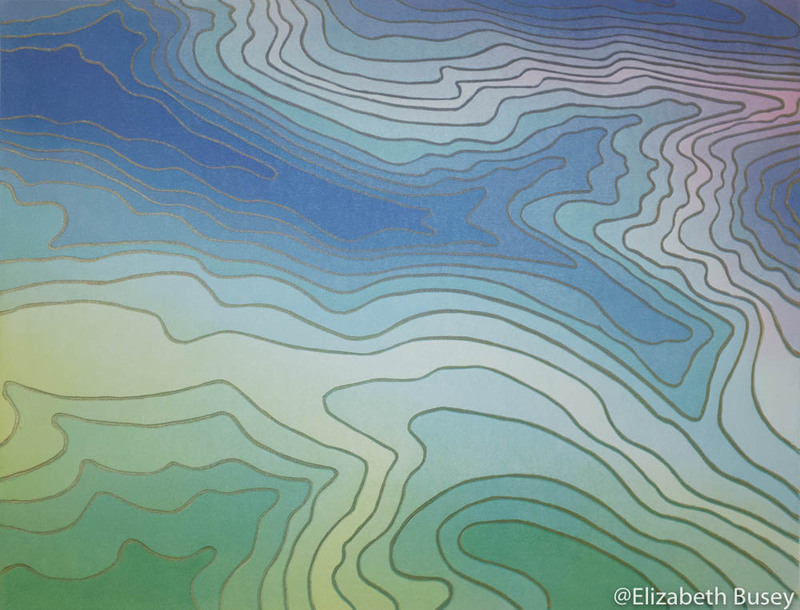 I wanted to create imagery that asked the question — what if aerial views were like topographical maps? To answer this question, I created both horizontal (above) and vertical (below) compositions. I imagined the views a hawk or turkey vulture might have, if they were flying around in a topo-filled world. Elizabeth Busey. The Grand Eternal Show. Reduction linocut on Rives BFK. 21 x 14in (image size), 31 x 23in (framed size), edition of 13, $375 unframed. To make these works harmonize, but not be the same, I used different views of the topography so that the largest shapes are repeated. I also wanted to find a way to make the layers not be completely homogeneous. To do this, I started both series with some loose diagonal color fields as the first layer of ink. I even reversed the location of each color for the different linocuts. The first layer had rough, inexact color fields. One of the more difficult tasks was remembering where to carve for each subsequent layer. Once a layer was carved away, I could not go back and touch up the linear marks that divided it from the others. Each time I printed, I also printed the line marks to keep them a consistent tone throughout, even if the color was somewhat different. The last layer — the lines alone — required some strategy. I could leave them with the darkest tone only, but this meant that the darkest areas were not well differentiated from a distance. So I went to my old friend, gold ink. I had been using a very old gold ink from Handschy, and wondered if another ink would give me more brilliance. I ordered some Charbonnel gold etching ink on a whim, and now was able to give it a try. As you can see from the video, this ink does not have the viscosity of most relief inks. I wanted to keep the pigment as intense as possible, since it was going to go over fairly dark blues and greens. The addition of some burnt plate oil allowed me to gradually roll out the stiff ink. The last layer need to print clearly. The thick gold etching ink did the job well. While the ink looked too thick on the glass, and didn’t make that velvety sound I usually strive for, it did adhere to the linoleum well and printed evenly on the ink-saturated paper. With one layer of ink, the gold sheen can be delicately seen, especially in the problem dark areas. I wondered if more gold would be better, and printed another layer of gold immediately. This gave me more gold reflection, but meant that now your eye was confused about what was important. I wanted the work to be more about the layers, with the lines playing a supporting role. So I stuck to one layer of gold ink. The feeling of satisfaction I had upon completing these two linocuts was one I haven’t felt in a long time. For this, I am eternally grateful. 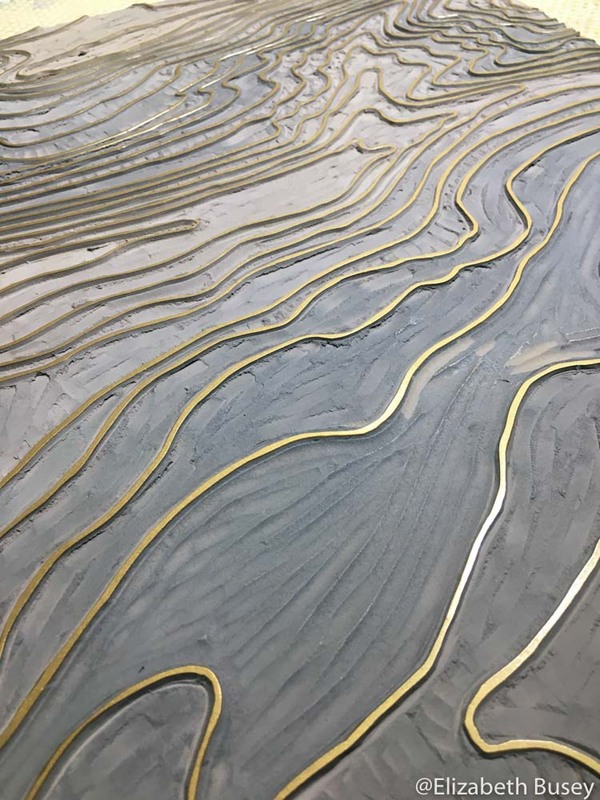 This entry was posted in Color Theory, Landscape, Materials, Topography, Uncategorized and tagged aerial, Charbonnel, gold, landscape, layers, topographical map, topography on December 1, 2017 by Elizabeth Busey. I enjoy getting lost in cities — at least on foot. I delight in the unexpected finds that are off the typical tourist trail. But sometimes life demands a predetermined order, and my life has felt like that of late. I have been wanting to do another linocut featuring the undulating forms of rice paddies, and my current project demands structure in the form of a key block. A test print of my latest linocut on newsprint. I’m wondering whether the large dark areas, when printed with an opaque green, will read convincingly as planted paddies. For printmaker who use multiple blocks, a key block is a familiar element. In Japanese printmaking — especially Ukiyo-e — the key block carries all of the final graphic information and is usually printed last in a dark color. Printmakers will also use this block to transfer information to other blocks so they will know where to carve away for each color block. April Vollmer has written a terrific book on Japanese printmaking called Japanese Woodblock Print Workshop if you want to read more about this technique. I never use key blocks with reduction printmaking. First, remember that I am only using one block. 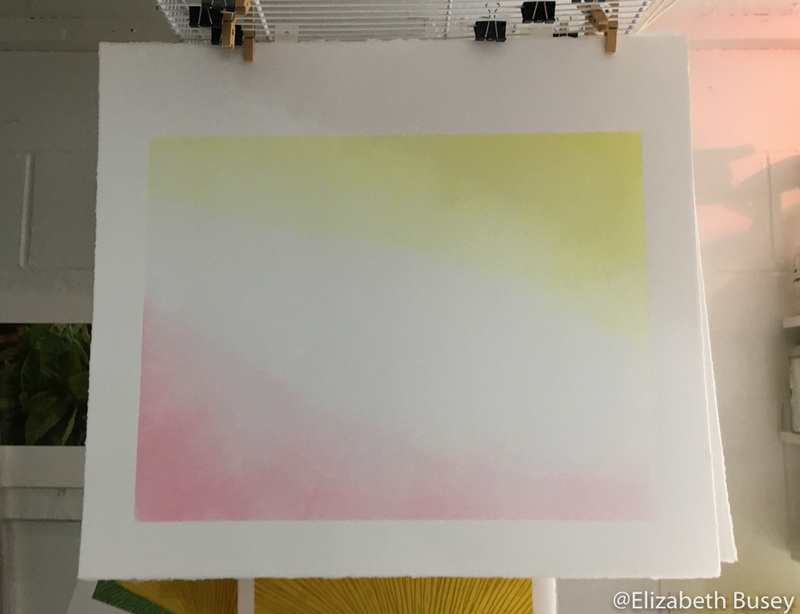 Sometimes the final stage of a block will look as though it is a key block, as I usually print the darkest color last. But I didn’t start with this last stage in mind; rather, the block evolved throughout the process. 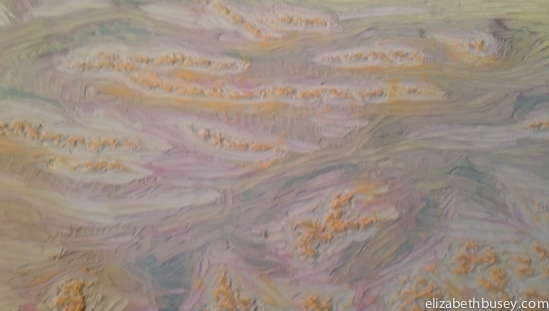 The last layers of my reduction work often look like this — where only the orangey part is actually printed. Not like a key block at all. My latest linocut has a key block though. I will be using hand dyed silk to create the floating world imagery that my imagination has been clinging to. With these dyes and the silk, colors can flow easily into one another in way that is impossible to create using my typical techniques. The large blocks of dark ink are where I am considering having some rice that remains to be harvested, while the other areas are reflected water. Carving a key block during this particular week has been a tonic. It is my equivalent of cleaning my house — a repetitive activity that has a tangible result at its end, but requires reduced thinking during the process. Like a working meditation, my mind can wander, my breath can slow. Now I wait for longer paper to be delivered and prepare to allow the silk dyes to flow unimpeded through the fabric. A peaceful process for a peaceful image. 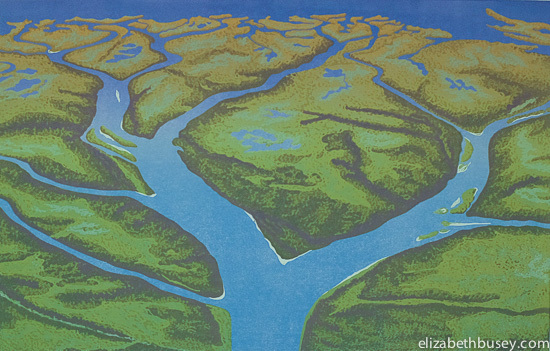 This entry was posted in Composition, Landscape, Techniques, Topography and tagged key block, Linocut, linoleum, printmaking, Rice paddies, silk, topography on November 17, 2016 by Elizabeth Busey. Perspective is everything. I’m not just talking about two or three point perspective here, but also the question of “Why do you do what you do?” What is your motivation? This is a question ask of every linocut I undertake. In all of my linocuts, I take a subject matter that is familiar and try to look at it through a different view finder. Take your thumbs and pointer fingers into L-shapes and make a square. When you crop the scene, how does it change your experience of the subject matter? I am most struck by how I experience topography, especially when viewed through the window of an airplane. 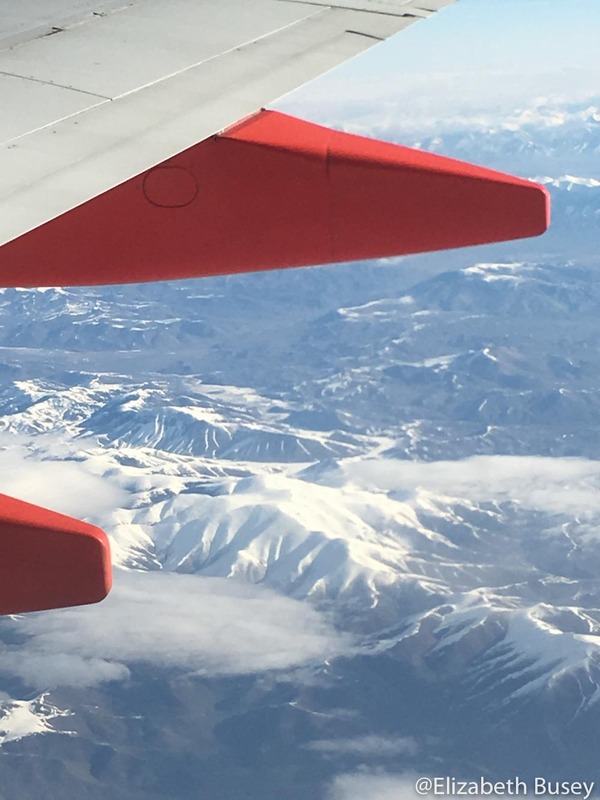 View of mountains on my way to Portland, Oregon. This entry was posted in Composition, Landscape, Topography and tagged eye, interest, Linocut, perspective, topography, Yvonne Jacquette on October 21, 2016 by Elizabeth Busey. Perspective in art is difficult. My early lessons came from sketching the interior of the Indiana University Art Museum, designed by famed architect, I.M. Pei. There are few right angles to be found except between the walls and the floor. So when I began my exploration of nature patterns and topographies, I was delighted to find that I could do this without using traditional perspectives. ©Elizabeth Busey. Tranquil Terraces Dawning. Reduction linocut. 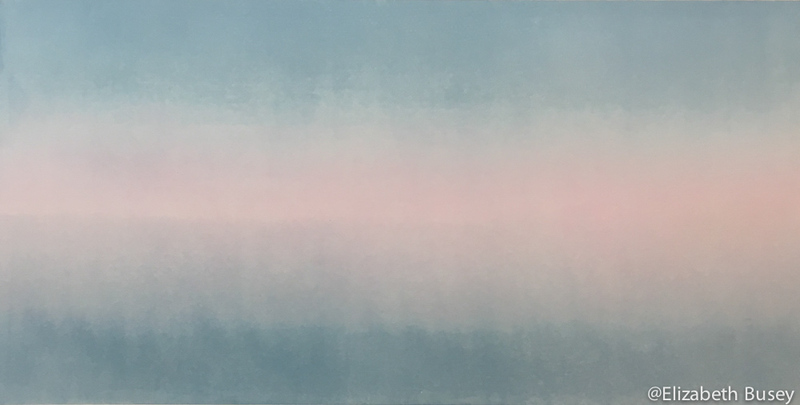 10 x 33in image size, edition of 19, $300 unframed. The reality is that sometimes, what you are exploring is interesting only in relation to something else. With clouds, your eye really needs some cues if you are to understand the scale and the vastness of each formation. You need a horizon. I slipped a horizon into my second linocut, Highway Caprice. Now with my latest linocut, I’m back to horizons again. You can see where I need to start experimenting with monotypes. This entry was posted in Composition, Landscape, Topography and tagged clouds, horizon, i.m. pei, indiana art museum, perspective, tranquil terraces dawning on April 22, 2016 by Elizabeth Busey. This image has been on my Iphone home screen ever since my first model. I captured these clouds with an Iphone 3 from the passenger seat of our 2000 Sienna minivan, as we hurtled west on I-94 through North Dakota. For all of the jokes made about North Dakota being uninteresting, I find the state a beautiful place to travel through by car. In the summer, the skies really are this intense blue, with horizons that stretch for miles and fields of bright yellow rapeseed punctuating the land. Elizabeth Busey. Highway Caprice. Reduction linocut on Rives BFK, 22 x 16in image size, $350 unframed. I try not to simply duplicate my photography when I create a linocut, but the cloud patterns I love move so quickly that a photographic record is a necessity. I get to take liberties with all the other aspects of the creation. Here I created a purple underskirt for the clouds, and a haze above the rolling hills. In my photograph, we had a highway rapidly disappearing in the distance, which I replaced with fields of slowly emerging rapeseed. Rapeseed is the seed used in Canola oil (a combination of Canada and oil), and its flowers are a shocking greenish yellow. Your mind and eyes have a difficult time resolving what you are actually seeing when you come over a ridge and see this colorful splendor. I did put the suggestion of a trail in my imaginary fields in honor of the many immigrants who probably trod through this landscape over a century ago. How splendid and hopeful this sweep of clouds must have been for travelers who were constantly wondering if they should change course. 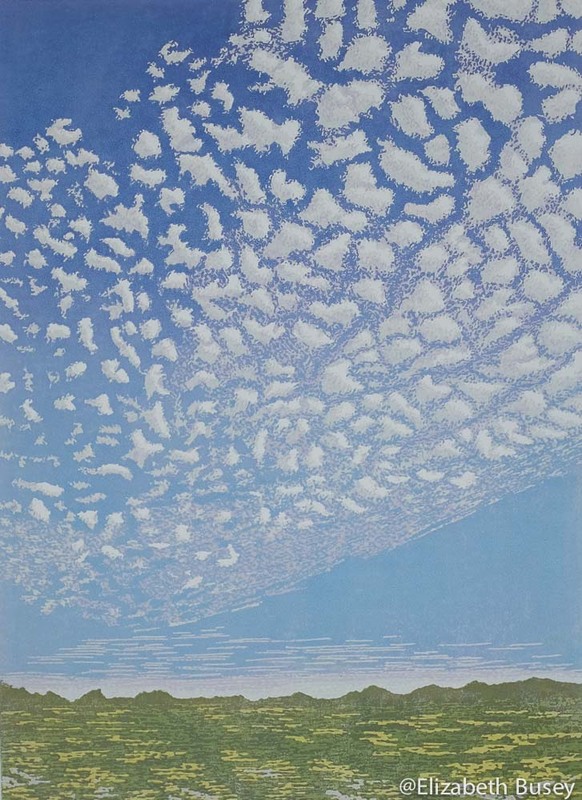 This entry was posted in Composition, Inspiration, Landscape, Topography and tagged Altocumulus clouds, Highway Caprice, Iphone, North Dakota, photography, reduction linocut on March 9, 2016 by Elizabeth Busey. One of the most challenging things for me about being an artist is that about half of the time I must be a businessperson. I must find collectors for my work, if for nothing else than I need to buy more paper. But in truth, I also need to find homes for my work because that conversation — between me and collector — is crucial. 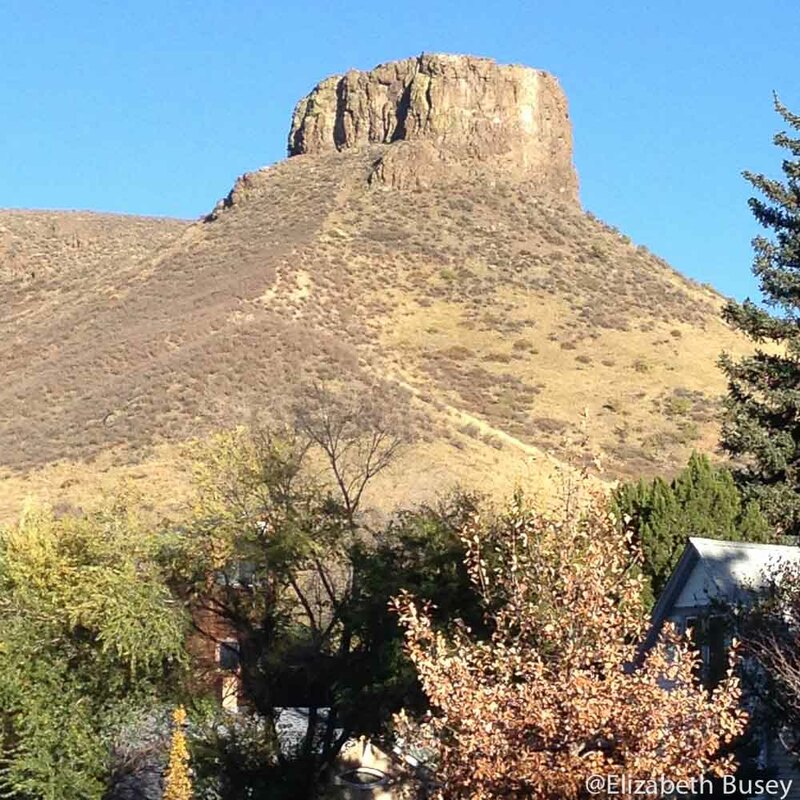 A butte in Golden, Colorado looms over the quiet college town. This entry was posted in Artistic Growth, Inspiration, Topography and tagged Art Biz Breakthrough, business cards, Colorado, Golden, inspiration, topography, travel on November 12, 2015 by Elizabeth Busey. I love topography. This should be obvious to even a casual reader of this blog. So I was delighted to have the opportunity to work with a local scientist on my first commission highlighting some spectacular scenery. ©Elizabeth Busey. Renaissance at Mossy River. Reduction Linocut, 14 x 22in image size, Ed of 9, $275 unframed. This entry was posted in Commissions, Topography and tagged avulsion, Canadian Shield, color, Douglas Edmonds, Fourth Street Festival of the Arts and Crafts, geology, Indiana University, Linocut, Mossy River Delta, texture, topography on September 3, 2015 by Elizabeth Busey. I love topography. Sometimes the colors are spectacular, or the rhythm of the shapes, but usually it is the texture. Unlike with lithography and some forms of intaglio, achieving texture in a relief print is tough. There is either ink or no ink. You need to get creative. 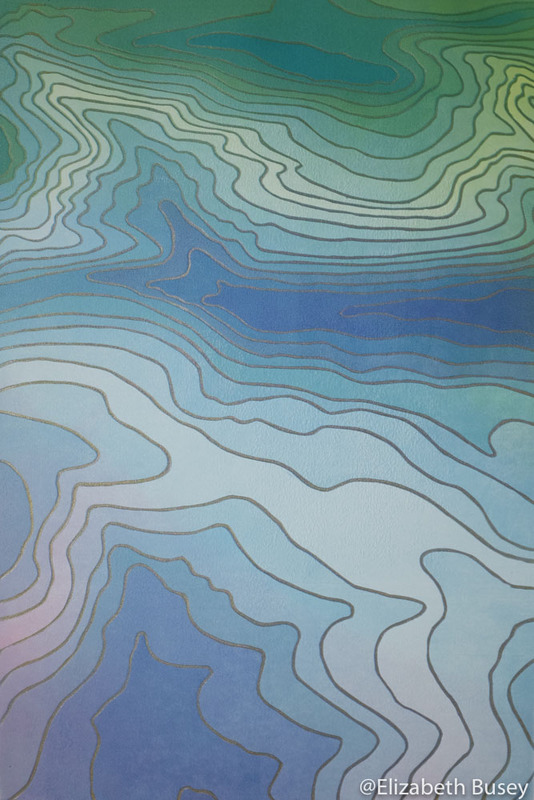 My latest linocut celebrates the textural contrast between land and water. 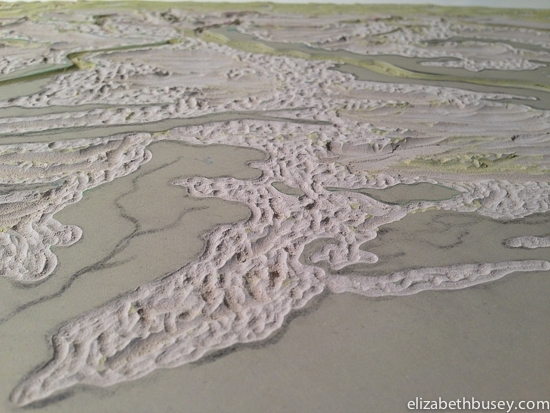 This entry was posted in Experimentation, Texture, Topography and tagged battleship grey, Dremel, engraving bits, Foredom, James Hubbard, knives, Linocut, linoleum, texture, topography, Wonder-Cut on August 20, 2015 by Elizabeth Busey.